Use plantar fasciitis splints in conjunction with insoles and orthotics inside your shoes to control your foot movement during the day. Stretching underneath the foot and the calf muscle is an important part of the healing process in plantar fasciitis and this unusual sock will help stretch the calf muscle at night and help stretch the plantar fascia underneath the foot. It normally takes just 2-3 nights to get used to wearing this sock at night. The idea is that the gentle stretch at night allows the plantar fascia to heal in a better position. Tips: Keep your toenails short to stop any pressure on them. Don't pull the strap too tight as it will pull your calf muscle too much and feel uncomortable. For Achilles Tendonitis and plantar fasciitis, heel pain and policeman's heel. 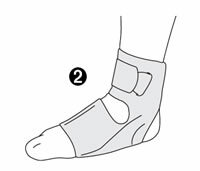 The Aircast Airheel Day Splint applies intermittent pulsating compression which massages the plantar fascia and Achilles tendon. 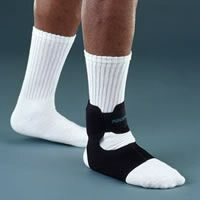 The brace supports the area which helps to reduce swelling and pain. The brace is lightweight and is worn during the day. It can be used when playing sport and can give a lot of relief to heel pain sufferers. 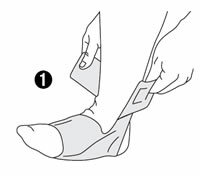 Insert your foot into the front of the Airheel, position your heel in the back and position the Achilles aircell over the tendon. The ProCare Night Splint is worn at night to stretch the plantar fascia underneath the foot and the calf muscle at the back of the lower leg to help reduce heel pain first thing in the morning when getting out of bed. How does the Night Splint work? The calf muscle at the back of the leg and the plantar fascia underneath the foot are gently stretched during the night. 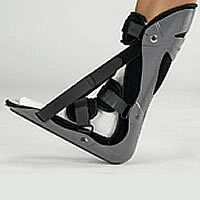 The splint extends from the back of the calf, around the heel and underneath the foot. It has two adjustable straps between the calf and sole of the foot and these are tightened to dorsiflex the foot (the toes are pulled up towards the shin). This dorsiflexed position stretches the plantar fascia which is underneath the foot. When this stretch is sustained for a prolonged period, such as overnight, the plantar fascia is in a good position for healing to start. Research has shown that night splinting is effective in relieving symptoms in over 80% of cases of plantar fasciitis. 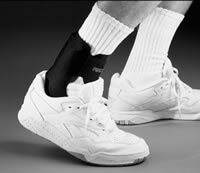 The Aircast A60 Ankle Brace is a slim and lightweight ankle brace which easily goes into a comfort shoe or trainer. The A60 ankle brace gives support and protection during sport, for recovery from ankle injuries, for chronic ankle weakness and for day to day walking if you have a chronic condition such as plantar fasciitis and heel pain. The brace fits well with orthotics for extra support, and has stabiliser splints on each side of the brace to prevent certain movements and to prevent the ankle from rolling over.